I haven’t been beauty shopping much* because I am trying to use up what I do have whilst also resetting my current collection – both in skincare and makeup. This month’s buys consist only of two brushes (featured here) but everything else are months old in terms of purchase, so you can imagine my delight when I finally got round to trying (and loving) them! *I’ve bought bits and bobs from Home Bargains the other day, but they were extremely cheap and cheerful. Half were essentials and replacement items! If you had to ask me, I am definitely more of a cleansing balm person. I prefer the texture, and really enjoy how it melts into the skin for that rich moment of massage. However, I recently tried out the Bobbi Brown Soothing Cleansing Oil and I am in love! It’s very different to other cleansing oils that I have tried before. It’s not greasy at all…for an oil, it is very clean as it doesn’t slip and slide – it’s very no-fuss. Best of all, absolutely NO residue. My skin always feels clean whenever I use this. I have been wanting to buy new brushes for months. I am still on the hunt but for now, I have two new brushes that I have been using a lot lately. The Real Techniques Bold Metals Brushes in ‘300’ is a tapered blush that’s great when you really want to define colour across your cheek bones. As such, it’s suitable for contouring too since it has that more precise tip. If you couldn’t tell, I own a bunch of Real Techniques brushes – not all that are in existence but most of the ones from their original line. To be honest, a few brushes are redundant however, I have found use for one unused brush recently and it’s the Real Techniques Pointed Foundation Brush. I’m very late to the game but I actually started highlighting and have been enjoying this to pat it on lightly and precisely. Contrary to its name, it is far too small to be a foundation brush of any kind but for highlight, I think it is great! If you have been following me for a long time, you may have seen this post before. I featured the Clinique Sheer City Block SPF 25 in it which I long finished. I recently repurchased it on sale and I still love it just as much. Funny story – I had a bit of a scare that this got discontinued because I couldn’t even locate it on the website, but I think they were just re-organising everything online and in-stores. The product has minimal coverage so it’s perfect for those no makeup makeup days. It evens out my skin and hides the minimal redness that I do have which makes it a staple in my kit. Plus, the SPF! I bought The Ordinary Foundations months ago when it was all the hype because of how inexpensive it was. I did open them and swatch them, but never did continue after that. Recently, I’ve been testing out The Ordinary Coverage Foundation in ‘1.2N’ and I do really like it! The shade is a tad light for me, but nothing a little face colour can’t fix! 😉 I particularly enjoy how good of a base it is underneath all my other makeup. It really melds everything together. Oil control is good too! It’s no secret that I’m not blessed in the eyelash department. They’re short and stubbornly straight which means not all mascaras hold a decent curl on my lashes. (Oh, the struggle.) I bought the Etude House Dr. Mascara Fixer For Perfect Lash upon recommendation from Stashy without a clue that it’s essentially a mascara primer. But it doesn’t matter – after one application, I realised how much a product like this was missing from my life. It lifts my lashes in a really clean manner, providing a stronger base that my mascara can cling onto rather than weigh down. I may have said before that I’m not a fan of the Lash Sensational but using this primer has really helped! My curl actually holds now and I can’t quite believe it. Recommend! 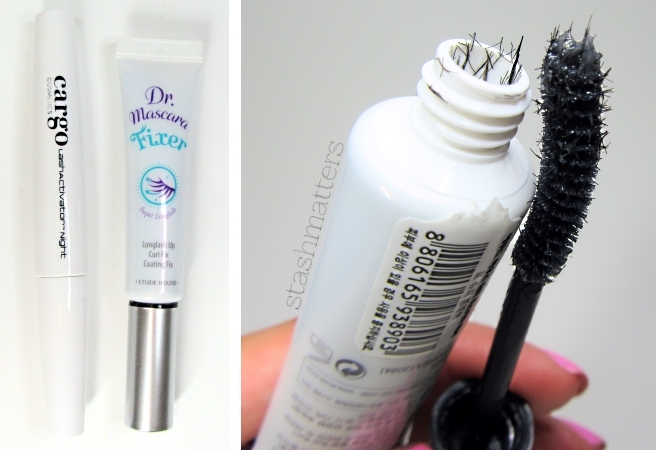 I really want to try the Etude House Dr. Mascara Fixer (also because of Stashy). I need major help in the eyelash department! A lot of people seem to prefer cleansing balms over oils. I personally like oils more because I feel like cleansing balms leave a residue that oils do not – it comes off on the second cleanse, but I still feel like the oils make my skin feel cleaner even if it’s not actually true haha. With that being said, I haven’t tried the Clinique Take the Day Off, which everyone says is amazing! I have tried both oil and balm for Clinique Take the Day Off. I prefer the balm but some people prefer the oil so it’s personal preference really. I do really like the oil, it’s just not an immediate first choice. I’ll tell you which cleansing oil I want to try at some point though – the Shu Uemura one! I love it! I also think the design is a bit more travel-friendly if you are going abroad or on a weekend trip. I love their original powder brush too but this is so much more softer! I’ll need to check the other brushes out. I might try the contour brush next? From the original line? Does the bold metals line have one? And yippee on the Dr. Mascara! Game changer. 😀 The Lengthening version has massive fibres in it and it poked at my eyes. But online reviews seem to like it. I hope it works well for you. Ohh that’s the thing about shade-matching online. It’s so risky, and even when you’re careful to pick, it’s still a wrong shade! 1.2N in the Serum foundation seems a better match for me than the 1.2N in the Coverage foundation for some reason. I’m glad I didn’t get 2.0N for sure – I figured it’d be better to go lighter than darker if anything. I wonder if 1.2Y would’ve been a better match for me? If you’re looking for Asian cleansing oils, please do try out MUJI’s Sensitive Skin version. I love it and it’s so inexpensive. I tried one of the Face Shop cleansing oils and I didn’t care for it – it left a residue on my skin. Nice range of products for your favourites. I’m also trying to use everything up because I tend to get more of the same thing and end up throwing old products away! I love the calligraphy background you used and definitely want to check out The Ordinary serum foundation and Etude House Mascara Fixer! Thank you Weng! 🙂 Haha, the calligraphy background is actually my duvet sheet. Definitely give those products a try, both are cheap and cheerful so you have nothing to lose really! I bought the Dr Fixer too~~~*LOL* also because of Stashy. My parcel hasn’t arrived yet. Wow, I’m really surpsied that Clinique is phrasing out that City Block. I swear that it has been around since the 90s. No, they’re not phasing it out but I thought they were! Wow, it’s as old as me then LOL. Wahaha well, good to know. Those brushes look so pretty! It’s good to know that they are also really functional as well.